It’s easier than ever to enjoy Bordeaux wine holidays and golf breaks in France. Here’s how to get here. You have no excuses not to visit us for golf breaks in Southwest France. In 2018, more than 5 million passengers have flown to international destinations from Bordeaux (+19% over 2017). 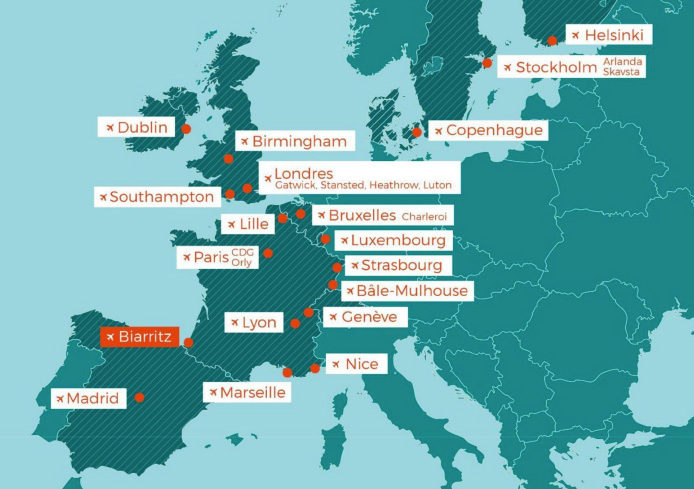 In fact, from 2019 you can fly to Bordeaux with any one of 33 airlines from 129 airports in 98 different cities worldwide. A map of all the airports you can use to get to your holiday in Bordeaux. Bordeaux’s Merignac Airport has released its first 2019 summer schedule and there are more flights than ever to the capital of wine. This includes 19 new routes and 18 new destinations including Helsinki, Manchester, Krakow, Tel Aviv, Köln, Vienna, Valencia, Copenhagen, and Montreal. 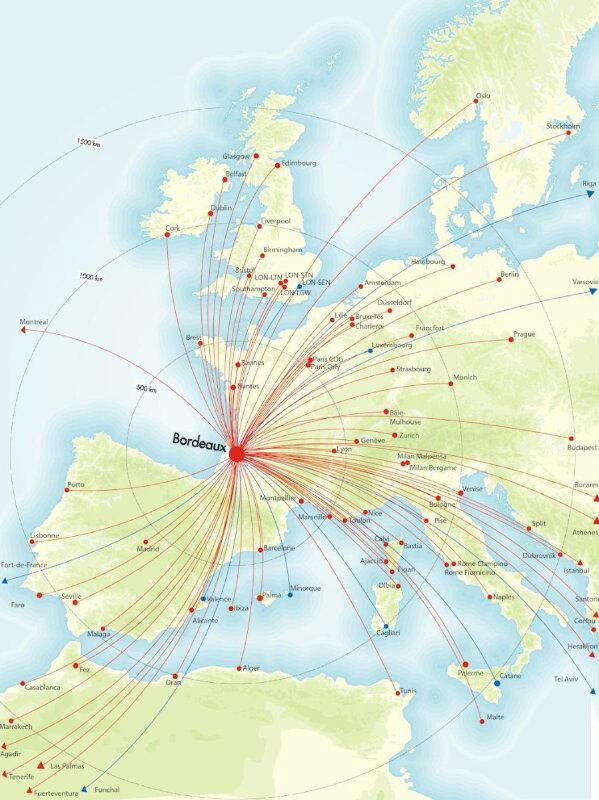 Other cities are increasing their daily flight schedule such as Dublin, Luxembourg and Zürich. New airlines are coming to Bordeaux such as Finnair, Air Canada. Ryan Air opened this autumn a new base in Bordeaux with many direct flights to the North and South of Europe. Take a look at the online list from Bordeaux airport. If you prefer to let the train take the strain, Bordeaux is linked to Paris via a high-speed railway line that gets you here in just 2 hours. The line links Bordeaux’s Gare Saint-Jean to Montparnasse in Paris. Trains leave several times an hour. For timetable information you can easily check on the SNCF website. And if all that’s not enough, it will soon get even easier to get to Bordeaux if you live in the UK. Eurostar are planning a direct London to Bordeaux service for 2020. The south coast is home to some of the best golf courses in France. Biarritz is an ideal base for your south west France holidays. The airport at Biarritz has flights from the following destinations. See our ‘getting here’ page for more information on transport options, including airport and airline websites. It also includes ferry details and links for getting to the Rioja region in northern Spain. Why not let us tailor a wine and golf in France holiday for you? We can help take care of your transport arrangements.